This guide is all about finding the best mini blender for your specific needs. These blenders are perfect if you need a simple portable blender for travel, small kitchen, or work. In this comprehensive overview I focus on the most compact blenders that take up little space, are easy to store, and easy to travel with. Who Would Want a Mini Blender ? I look at mini blenders as a subcategory of personal blenders in that they both blend a single-serving portion but mini blenders are smaller and lower powered than many personal blenders. Mini blenders also are typically lightweight, compact, and in the lower price range of single-serve blenders. Personal blenders can be larger in size, offer more capabilities, more accessories, more power, and have a wider price range compared to mini blenders. We don’t include our favorite personal blender models in this guide. Compact mini blenders are small and typically designed for making small batches of smoothies, protein shakes, blending baby food, and basic food prep tasks. These blenders are typically under 300 watts and have smaller containers under 24 ounces. They are excellent blenders for small spaces like dorm rooms, travel, and if you want a portable blender at work. The motors on these blenders are fine if you want a small-portion smoothie but they will typically start to struggle blending certain ingredients like hard raw vegetables, fibrous vegetables (celery and kale), and hard nuts or seeds. If you are looking to make frequent green smoothies with a wider range of ingredients then a stronger single-serve blender would probably be a better fit for you. Positives: The main advantage of portable blenders is that they can perform simple blending tasks in a small space. They offer decent power for their capacity and many are very affordable. Negatives: Mini blenders are really ideal for small portions and specific uses like easy blending tasks (protein shakes or fruit smoothies) and food prep. The container sizes are smaller than most personal blenders. Also, mini blenders can wear out faster from overheating if you try to use them for blending jobs like crushing ice and thick smoothies. The criteria above as well as performance, reviews, independent tests, reliability, and price point were all considered when choosing the following mini blenders as my top choices. The blenders are ranking in order of preference. Editor Note: While the blenders I chose below offer good quality for the price they can be prone to breakage from misuse. The motors on most mini blenders work fine if you use enough liquid and don’t try tasks like crushing ice. For the low cost of these blenders, they are pretty reliable if you use them for what they are intended for. The compact size will also require you to have the ingredients in small pieces before blending. Hamilton Beach has multiple small blender models and the most popular is the 51102 which comes with 2 jars and 2 lids (They also have 51101, 51101BA, 51103 which are the same blender with slight variations and similar price). The unique design has the blade built into the jar as one piece which requires less components and easy clean up. The downside of having the blade attached is when you take the jar on the go you have the blade base attached on the bottom. I like the wider cup design of this compared to some other mini blenders as it is easier to fit ingredients into the cup, the blade has more surface area with the ingredients, and the wide cup makes it easier to clean. 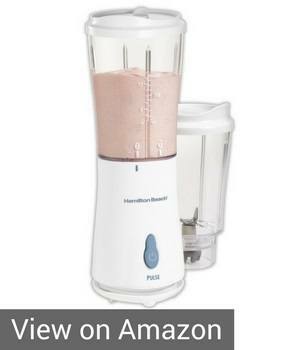 It works best for simple blending tasks as it has a 175 watt motor and small 14oz jar. This blender has many positive user reviews about its ability to make baby food, simple smoothies, purees, grind coffee beans, salad dressings and even frozen drinks. It It is NOT intended for hot liquids and may struggle with thick smoothies. It is perfect if you want an ultra compact blender as it measures 11 inches tall x 5 inches wide and weighs less than 5 pounds. The cord wraps underneath the blender base for easy storage. Positives: Over 3000 consumer reviews with overall positive feedback and many raving reviews for this low cost blender. (See Review #1 and Review #2 . Great mini blender for smoothies. Good Housekeeping tested this blender and gave it 4 out of 5 stars with high ranks for blending smoothies. It is powerful enough to blend frozen fruit and ice but make sure you use enough liquid when doing so. The 51102 model comes with 2 blending jars so you have a backup. The jar has a nice wide mouth for easier cleaning and is easy to drink from. Also, the base of the cup fits well in car drink holders. Simple to use and clean up. Negatives: The 175 motor will limit the versatility and types of ingredients you can use compared to a more powerful blender. It uses a pulse button for blending so you have to manually push the pulse button to do short pulses until the ingredients are blended. (If you hold the pulse button down the entire time then you may wear out the blender faster and cause it to overheat). Overall Opinion: For the low price, the Hamilton Beach personal blender is awesome. It is my favorite mini blender for smoothies and is a good mini blender for baby food. Also, it is the perfect travel blender because it can easily fit in a travel bag. Overall, it is a great choice if you have realistic expectations on what you can blend (Example: You can’t make hot soups or try to crush ice only). Read the instructions for proper use. The Oster Blend N Go MyBlend is my 2nd choice and is a popular inexpensive blender for making quick healthy shakes. It was our top pick as a protein shake blender for the gym and for taking on-the-go because it is portable, simple to use and very low cost. It measures 15” Tall x 5” wide x 5” deep so it is a little taller than other portable blenders. This blender uses a 400 watt motor (250 blending watts) which is more powerful than the Hamilton Beach mini blender above. The most unique feature is the 20 ounce BPA free container that looks like a sports bottle. While the bottle is stylish looking and great for taking your drink on the go, I prefer the wider Hamilton Beach cup which is more user friendly and has more blending space for the blade. The Oster My Blender is reasonably well built for the low price and I like that it has a re-settable fuse to prevent overheating. (Overheating can happen with low powered blenders because they take longer to blend). Positives: It blends well if used properly (meaning that you need to use enough liquid when blending). It tested well at Good Housekeeping with high marks for blending. It can blend fresh or frozen fruit and vegetables pretty well with enough liquid. It is VERY low priced for the good performance. It is powerful, simple to use, and the travel cup is easy to drink from. Negatives: It isn’t intended for use with ice and can struggle if you don’t use enough liquid. The narrow container can make it more difficult for raw ingredients like fibrous vegetables and nuts to have enough room to properly blend and not get stuck at the bottom. Note- It is great for blending liquids,powders, and soft ingredients. While many reviews are positive, there are some user complaints about durability. 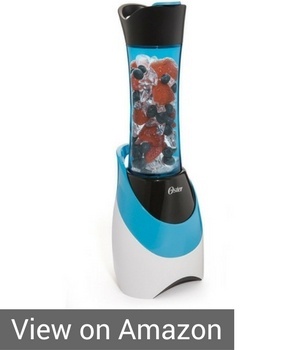 Overall Opinion: Oster mini blender is a powerful portable blender for a very low price. It is an excellent travel blender and is perfect if you want a small lightweight blender for work or the gym. In comparing the Hamilton Beach vs Oster mini blender, I have a slight preference for the Hamilton Beach because of the multiple user-friendly cups and more compact design. 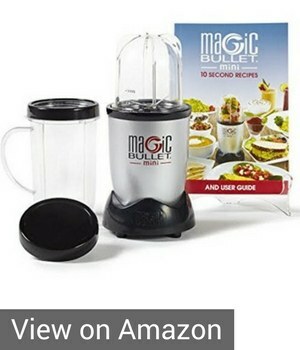 The Magic Bullet Mini is a compact version of the best selling Magic bullet. I’ve written extensively about the larger Nutribulllet blenders which I really like and the Magic Mini Bullet is tiny in comparison measuring 9 inches tall by 5 inches wide. The 120 watt Mini bullet comes with a 12oz or 8oz which is plenty of power for that cup size. The Mini Bullet has the same wide cup design of their bestselling models which allows plenty of room for the blade to properly blend all ingredients. (NOTE- Mini Bullet accessories are not interchangeable with other bullet blenders) . It is designed to blend small portions and can easily make soups, smoothies, dips, and sauces. It is not designed to crush ice. It is really designed for blending easier ingredients as we found in our Magic Bullet vs Nutribullet tests. If you want a slightly larger more powerful blender then see our Nutribullet blender comparison. Positives: With enough liquid it blends very well and can puree ingredients faster than other blenders this size. It is very compact and a decent portable blender for very small spaces. You should be able to blend everything in under 15 seconds with this blender. Negatives: The 12oz container might be limited for some people as it will only hold enough ingredients to blend down to about an 8-10 ounce smoothie. There are some complaints from some consumers about it overheating but that is usually because people blend for too long with a mini blenders. It can struggle in blending some harder ingredients. More expensive than other portable blenders with this power. Overall Opinion: I love Nutribullet blenders and the Mini Bullet is a decent mini blender. The main reason I ranked it lower is that it is 2x the price of the Hamilton Beach mini blender and the Oster My Blend. The Mini Bullet can blend some ingredients better than the top mini blenders but the 12oz jar can be more limited. It is a pretty good blender for the size and design. The Bella rocket is a compact blender with multiple cups and blades. It has a 240 watt motor and is marketed for its ability to multi-task such as chopping, blending, and food prep. It is very compact measuring about the same height as the Hamilton Beach blender. It comes with a blending blade, milling/grinding blade, 1- 13oz cup, and 2- 22 oz cups with travel lids. Positives: This is a very compact blender and low priced. It has reasonable reviews after being on the market since 2012. The overall feedback is above average with well over 3000 user reviews on this blender across multiple retailers like Amazon, Macy’s, and Walmart. I like the extra blade and accessories that come with this blender for such a low price. Negatives: The 240 watt motor can be limited and take a little longer to blend. Some complaints of it being loud and problems with durability. It can struggle with blending hard smoothie ingredients and nuts. Overall Opinion: The Bella Rocket blender is a decent compact blender and provides a lot of value for the low price. It is surprisingly very lightweight at under 5 pounds. I ranked it at #4 in our list because it is so compact, well priced, and has decent accessories. I give a slight preference to our top picks over the Bella due to user feedback and performance. For more details, see our comprehensive Bella Rocket Blender review. Epica is a newer kitchen appliance brand and their compact blender model was introduced in 2016. It offers a 250 watt motor with powerful 23,000 rpm. Nice 2 year warranty. Small 5.25” footprint. Positives: Decent power and a nice design look for this low price point. Good reviews and simple to use. Demonstration video of Epica blender provides perspective on its size. Negatives: A less known brand that isn’t widely sold except on Amazon. At these low price points, I put more weighting into how long a blender has been on the market to make sure they have had a enough time for users to comment on its reliability. There are a couple complaints about the blender failing within the first year that are worth reviewing but overall the reviews are positive. 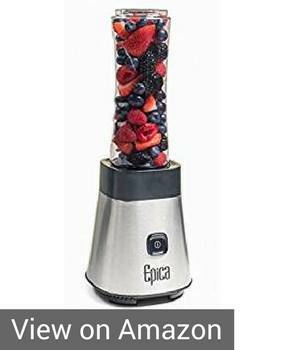 Overall Opinion: The Epica has some a nice clean design for the low price and competes well with other blenders at this price point. I would go with the more reputable Oster MyBlend versus the Epica since they have similar design, power, size, features and price. The Cuisinart mini blender CPB 300 provides nice power for the compact size with 350 watts of blending power. It comes with a 32oz blending cup, four 16oz blend and go cups, one 8oz chopping cup, blending blade, and a chopping blade. I love the large 32oz cup so you can do larger portions than many of the other portable blenders. This Cuisinart blender has a narrow design and would be a good gym blender or portable blender with the 16oz cups. Positives: Has multiple control buttons for high, low, and pulse which is great if you will be doing more than just blending. It has a really nice mix of features and power for the size. Cuisinart’s higher power and larger 32oz cup provide more versatility than other mini blenders. Negatives: The biggest issue with this blender is price at 3x the Hamilton Beach. For mini blenders, the Cuisinart is heavier than the others which isn’t as ideal if you want a portable travel blender. 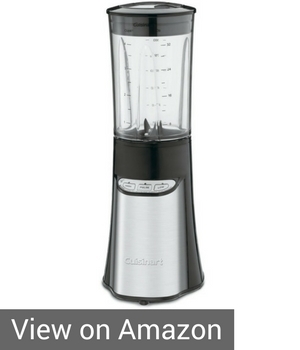 Overall Opinion: I love Cuisinart appliances although their blenders don’t usually rank near the top in blender tests. The CPB 300 does offer a lot of power and nice accessories compared to other mini blenders but you pay a high price for that that. It is a little heavier than our top choices so Cuisinart might not be the best portable travel blender. At this price point you start to compete with more powerful personal blenders which is why we ranked it lower than our top picks. Black and Decker Fusionblade – Good for smoothies and protein shakes. Simple controls. 275 watts blending power with 2 20oz jars with twist on travel lids that that you can take on the go. It measures 14 inches tall and 5.5inches wide so it isn’t the smallest blender but it is similar in size to the Oster My Blend and has a small footprint. This isn’t a bad blender but our top picks are better choices. 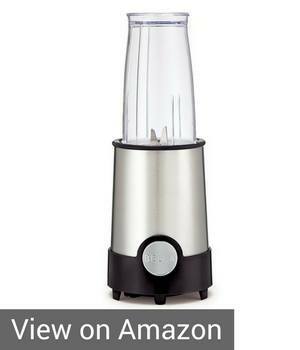 Oster My Blend Pro Series BLSTPB2-WBL – The Pro series is similar to the Myblend blender that we reviews above but the Pro series version offers 350 watts blending power(100 watts more than the Original My Blend) and has a more stylish to-go bottle. The reason I didn’t choose this blender over the original My Blend version is that the Pro Series has more complaints about the design where the blade assembly breaks. Tribest Compact Blender – Tribest PB 150 has 200 watts and measures about the same size as the Hamilton Beach mini blender that we reviewed above. The Tribest performs okay in various independent comparison tests but not enough to justify the high price. Also, it is loud. It is priced over 4x the Hamilton Beach blender. Mini Ninja Blender – There isn’t a specific Ninja blender that is called a mini blender but the most portable are either 1)Popular Nutri Ninja blender which is larger than the mini blenders in this article and 2) Ninja Express Chopper which is like an upside down blender that is designed more for chopping and food prep but does well with pureeing simple smoothies. The Ninja Express is compact, lightweight, and customers generally love it. It might be a good fit if you want the ability to blend and do food prep. For more information about Ninja blenders, see our detailed Ninja Blender review. Other Portable blenders that I didn’t include Keyton, Haier Portable Blender, HomeGeek, and Cosori. Also, I didn’t include mini hand blenders in this guide because they are too weak and are really only intended for light whipping and frothing. 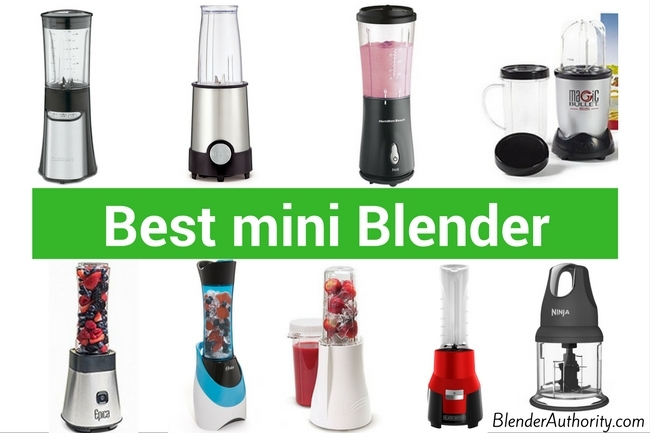 The top mini blenders that I ranked in this post are based on many factors and are all good choices. This guide was focused on mini blenders for portability and size. I included demonstration videos of all the blenders I chose so you can get a perspective of size since the focus of this guide is compact blenders. There are other portable blenders that we included in our best battery powered blender guide that you you might find useful depending on your needs. If you just want a simple, compact blender that is easy to take on the go then I like the Hamilton Beach. If you have a question then please leave it in the comments below. Happy Blending ! would like to know what is the best battery powered blender to blend hot food that is portable for travelling and having at rest spots. Hi Doreen, there are not a lot of options but we do have a guide to the best battery powered blenders which you should find helpful.